The BRUNeumatic SEED BLOWER/VAC is versatile. Got a spill? Vacuum it up quickly. 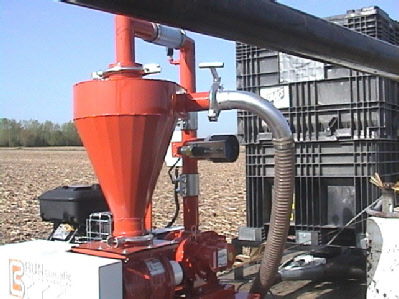 It blows into seed boxes to fill or use the suction to completely empty the box to change varieties. The BRUNeumatic SEED BLOWER/VAC is efficient. 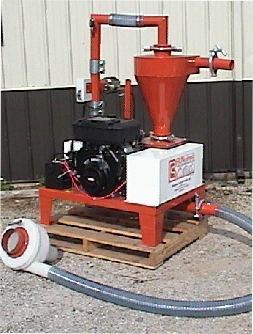 It handles bulk seed without damage typically caused by augers. 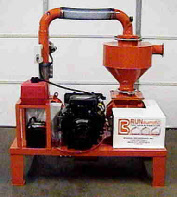 The BRUNeumatic SEED BLOWER/VAC features a cast iron airlock for long life. Powered by a Briggs & Stratton Vanguard overhead valve twin cylinder engine and including fifty feet of hose and plastic cyclone, this unit is ready for rugged use. Featuring a wireless on-off remote controlled butterfly valve which is activated the BM Actuator. 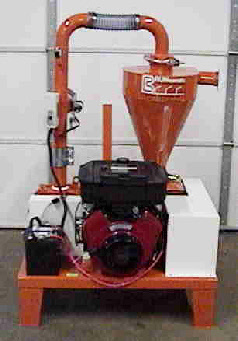 A True Push - Pull Vacuum / Blower System. It does not need to be attached to any specific bulk seed container or wagon. It can be mounted on a drill, planter, truck, trailer, or hopper bed wagon, or exactly where you need it to be. It can be used to transfer from trucks to wagons, to storage. 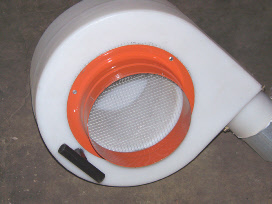 It can be used to vacuum seed out of drill, planter boxes, or seed cubes.